This article is about the Sicilian bread and the sandwich made from it. For the Passover crepe, see mofletta. The muffuletta is both a type of round Sicilian sesame bread and a popular sandwich originating among Italian immigrants in New Orleans, Louisiana using the same bread. 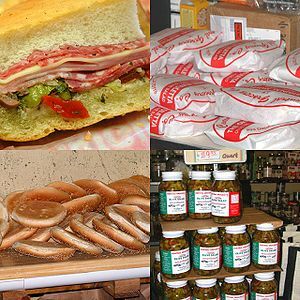 The muffuletta sandwich was created in 1906 at Central Grocery Co. on Decatur Street, New Orleans, Louisiana, USA, by its owner Salvatore Lupo. Sicilians, however, have been making various versions of the bread for centuries. It is commonly eaten during celebration days. In Palermo it is most commonly eaten on the Day of the Dead, November 2. A muffuletta is a large, round, and somewhat flattened loaf with a sturdy texture, around 10 inches (25 cm) across. It is described as being somewhat similar to focaccia. Bread used for the muffuletta is different from focaccia in that it is a very light bread, the outside is crispy, and the inside is soft. It has no additional seasonings baked into it, aside from the sesame seeds. The bread is more like a baguette, but slightly heavier. It is most akin to an Italian dough recipe. Italian dough includes flour, water, egg, olive oil, yeast, salt and sugar. A baguette is made from flour, water, yeast and salt. A muffuletta is usually served cold, but many vendors will toast it. This was mentioned in the PBS special Sandwiches That You Will Like. In Greater New Orleans a seafood sandwich is made with muffuletta bread and fried seafood, often including oysters, shrimp, catfish and occasionally softshell crab. The seafood muffuletta omits the olive salad in favor of the traditional dressings of a seafood po' boy, such as melted butter and pickle slices, or mayonnaise and lettuce. The forms muffoletta and its iterations are modern Italianisms of the original Sicilian. Like many of the foreign-influenced terms found in New Orleans, pronunciation has evolved from a phonetic forebear. ^ Orchant, Rebecca (12 February 2013). "The Muffuletta: New Orleans' Original Italian Sandwich". Food & Drink. Huffington Post. Oath Inc.
^ "1906: The muffuletta is created in New Orleans". Times-Picayune. NOLA Media Group. 10 October 2011. ^ Barreca, Francesca (21 January 2010). "L'originale muffuletta". The Fooders (in Italian). ^ Herman, Michael (16 March 2012). "New Orleans Street Foods, Snacks, & Sandwiches: Po' Boys, Oysters, Muffulettas, Beignets, Pralines". New York Food Journal. ^ a b c Avolio, Corrado (1882). Introduzione allo studio del dialetto siciliano: tentativo d'applicazione del metodo storico-comparativo (in Italian). Uff. Tip. di Fr. Zammit. p. 59 – via Google Books. ^ a b c d Pfister, Max (1997). Lessico etimologico italiano (in Italian). 6.1. Reichert. p. 441. ISBN 978-3-89500-019-5 – via Google Books. ^ Biblioteca del Centro di studi filologici e linguistici siciliani: Issues 1–4 (in Italian). 1977. p. 28 – via Google Books. ^ a b Pitrè, Giuseppe (1889). Usi e costumi, credenze e pregiudizi del popolo siciliano (in Italian). 17. L. P. Lauriel di C. Clausen. p. 360 – via Google Books. ^ Ciccarelli, Diego; Valenza, Marisa Dora, eds. (2006). La Sicilia e l'Immacolata: non solo 150 anni. Collana Franciscana (in Italian). 15. Officina di Studi Medievali. p. 39. ISBN 978-88-88615-96-7 – via Google Books. ^ a b Dizionario tascabile familiare siciliano-italiano (in Italian). 1. Palermo: Stamperia Spampinato. 1840. p. 66 – via Google Books. ^ Pasqualino, Michele (1790). Vocabolario siciliano etimologico, italiano e latino (in Italian). 4–5. Reale Stamperia. p. 26 – via Google Books. ^ Mortillaro, Vincenzo, ed. (1844). Nuovo dizionario siciliano-italiano (in Italian). 2. Tip. del Giornale letterario. p. 75 – via Google Books. Central Grocery Co. — Home of the American-style muffuletta sandwich. McDaniel, Rick (18 February 2009). "Muffaletta Bread (Recipe)". Chef Rick's Southern Cooking.